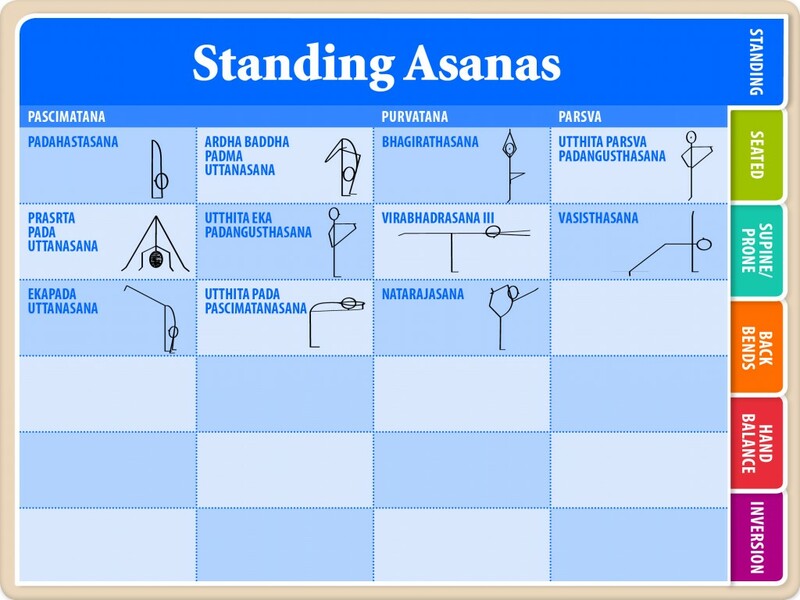 The companion set to Viniyoga Asana I. 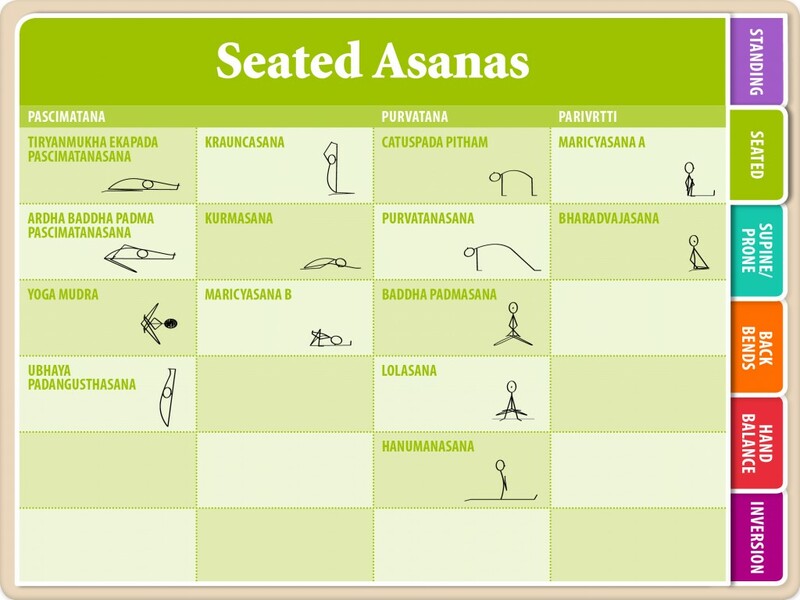 This set contains 56 more intermediate yoga asanas for you to learn the yoga pose names in Sanskrit and English along with pictures of the yoga stick figures which you can instantly download. 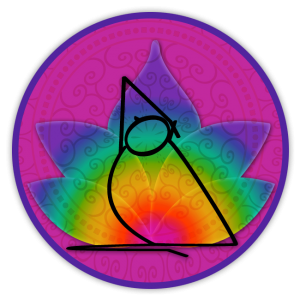 Available as downloadable interactive yoga ebooks and images or as printed flash card yoga books. 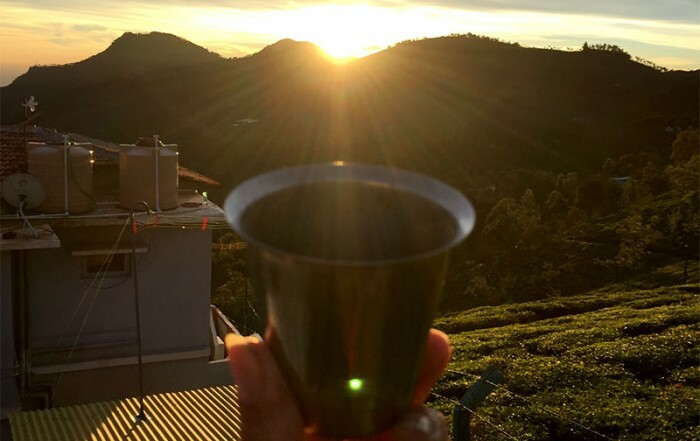 Learn anytime and anywhere. 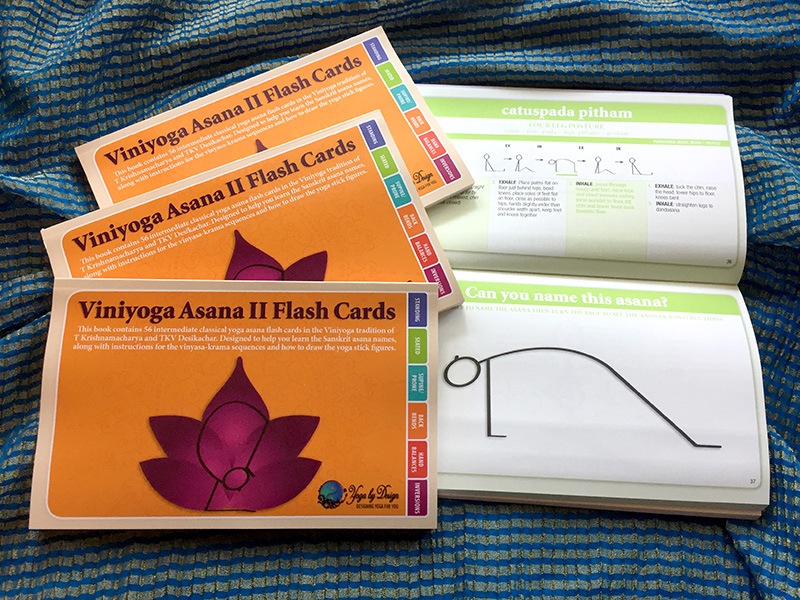 These yoga flash cards are a great reference for any yoga student and make great yoga teacher training books. 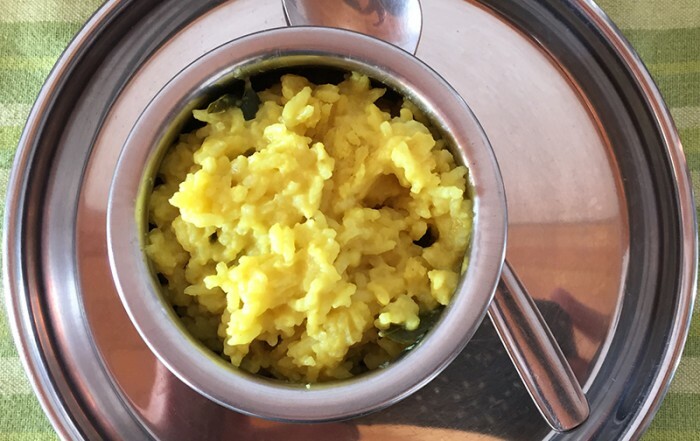 Viniyoga is popularly used today to describe the yoga taught by the late Sri T Krishnamacharya and his son TKV Desikachar, founder of the Krishnamacharya Yoga Mandiram (KYM) in India. 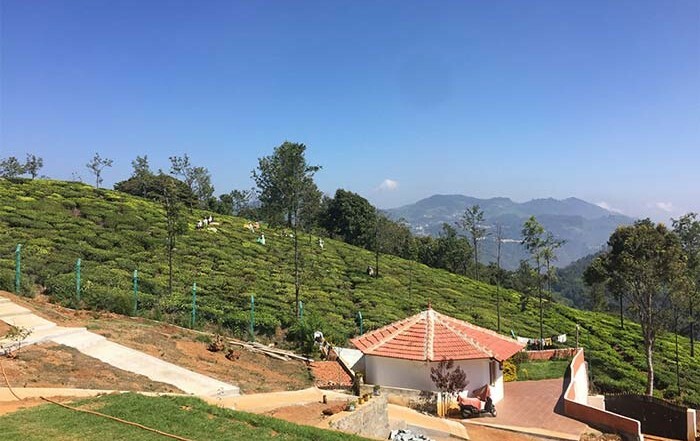 However, it is not actually a ‘style’ of yoga, but is an approach using Yoga’s many tools – asana, pranayama, meditation, mudra, chanting etc. 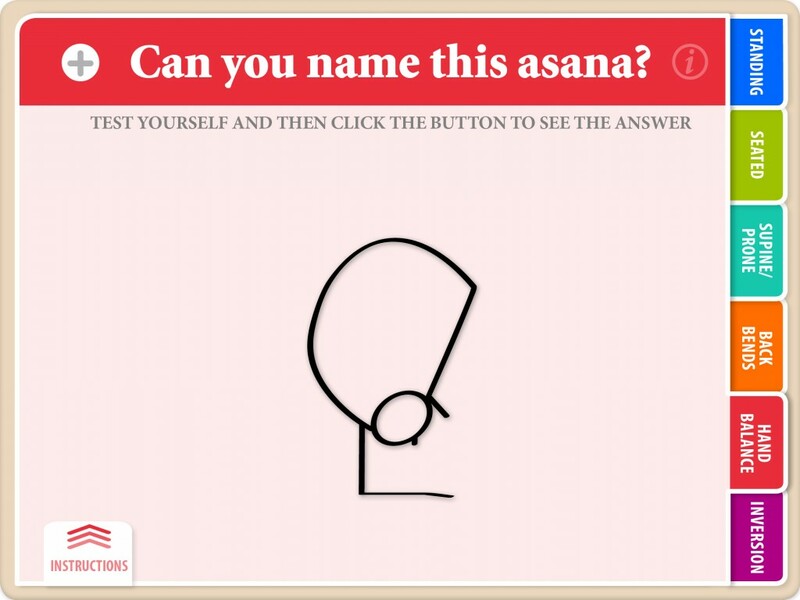 When you buy the interactive eBook, with just a few taps, the answers are at your fingertips! 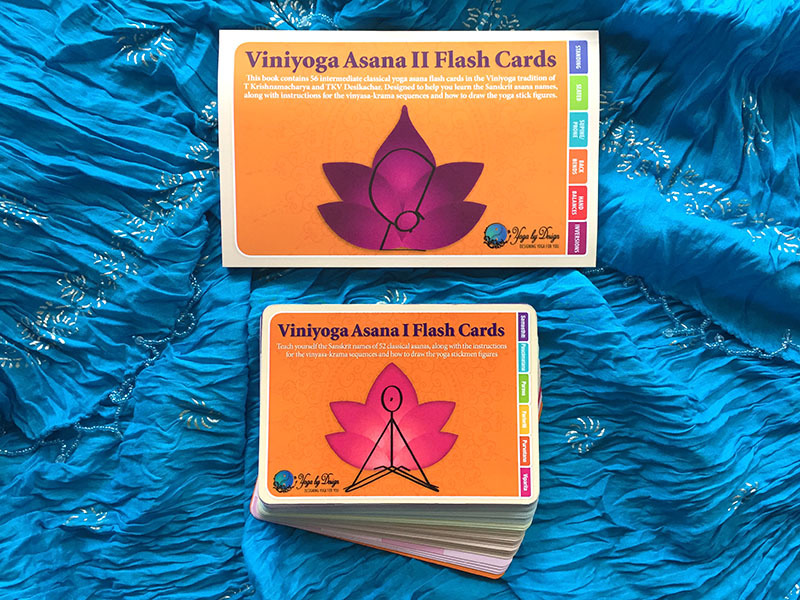 Viniyoga Asana II yoga flash cards are the companion flash card set to Viniyoga Asana I and add a further 56 intermediate yoga asanas to learn. 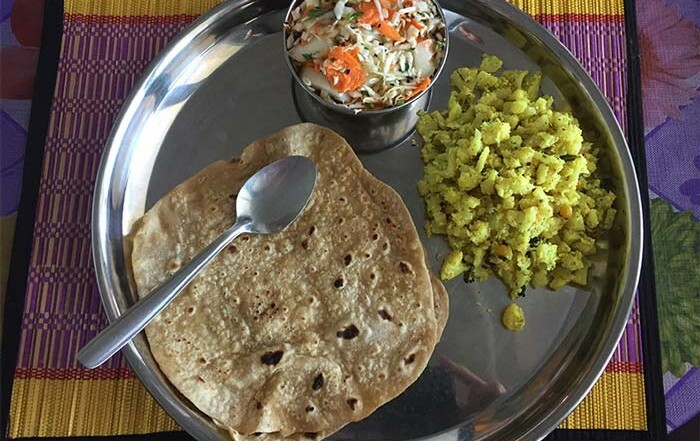 Listed below are a few ideas on how to use the ebook. 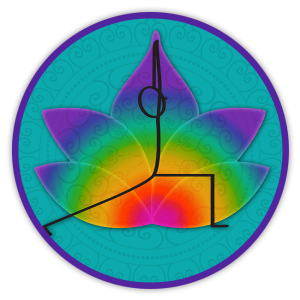 Test yourself on learning the asana names, learn the full vinyasa-karma sequence to move into and out of the pose, or even just learn how to draw the yoga stick figures. 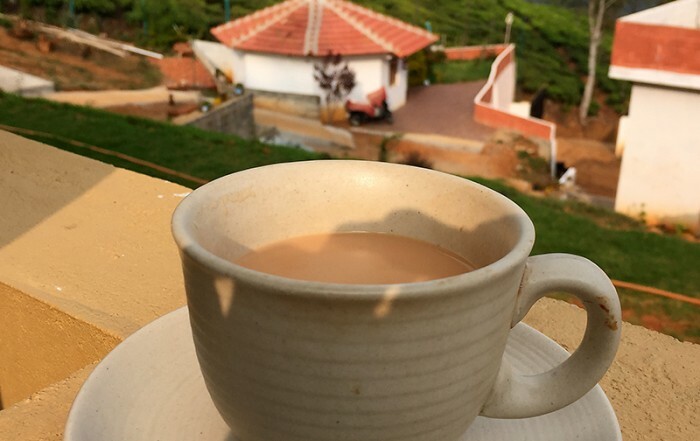 There is a lot to keep you coming back each day. 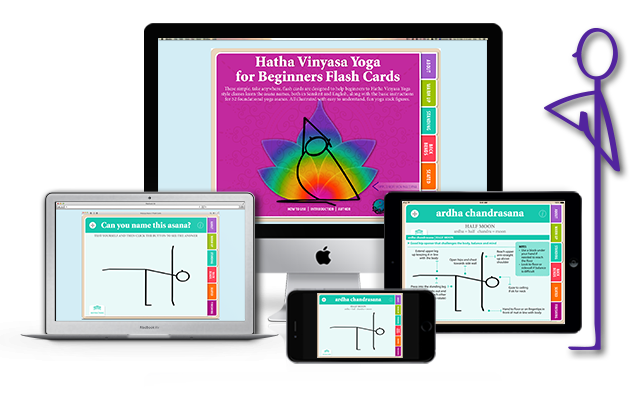 The simplicity of Yoga Flash Cards make them a great learning tool and the best yoga teacher training books – all of the important information for each asana is displayed clearly on just one page making it easier for the mind to digest and, therefore, making learning faster. 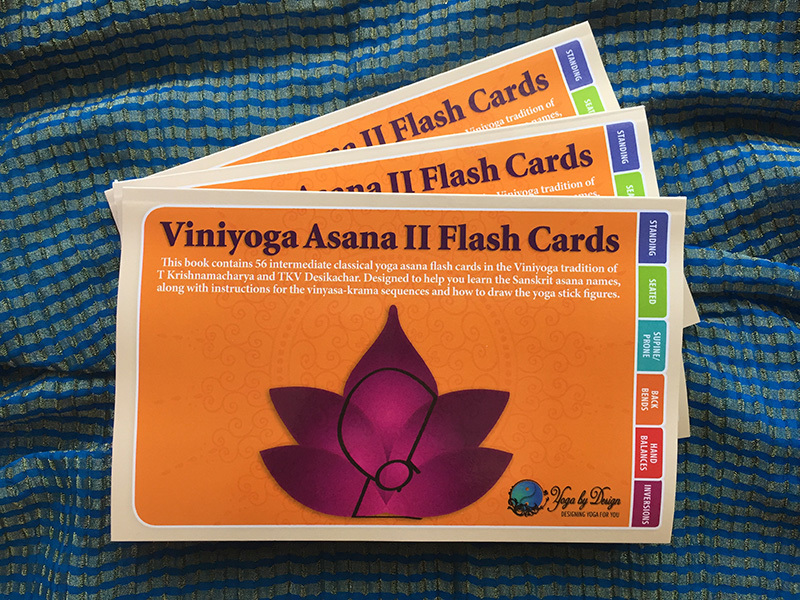 The Viniyoga Asana I Flash Cards have also been approved by Yoga Australia (the peak professional body for Yoga in Australia) as a Yoga Teacher Training Manual. 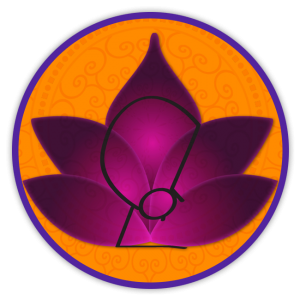 Each asana flash card initially has the asana name (yoga pose) and instructions hidden to prompt you to learn the asana names first before the answer is revealed. 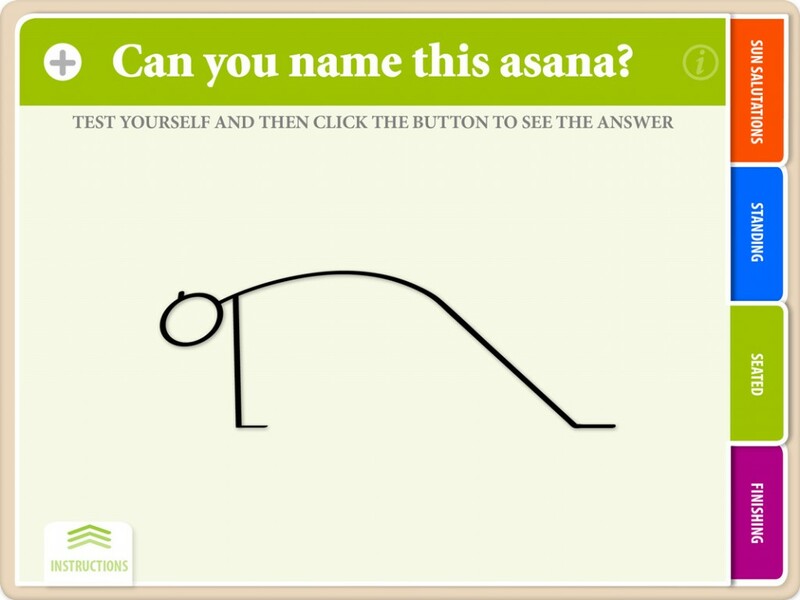 When you are ready to reveal the answer, press the button on the top left and the correct Sanskrit and English asana name appears, along with a transliteration of the Sanskrit which will help you learn the names of the yoga poses much faster. 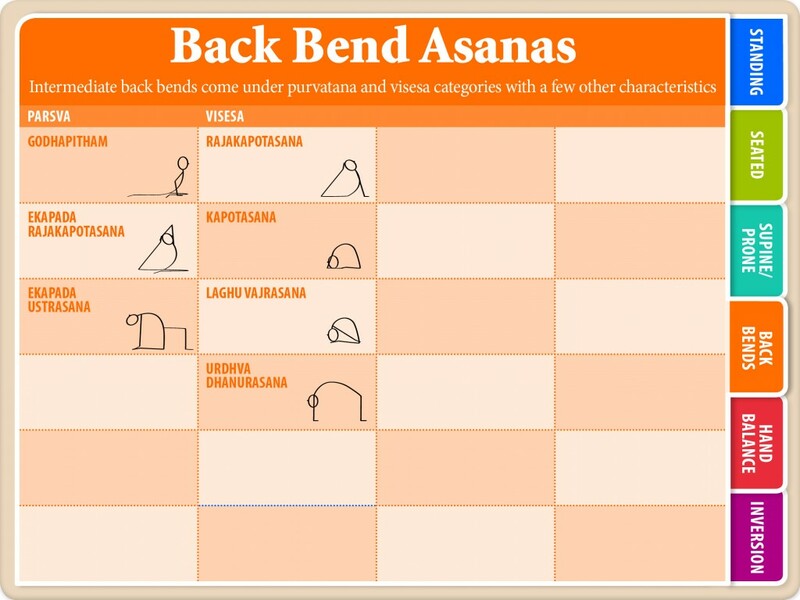 How did you go – did you get the name of the asana correct in Sanskrit and/or in English? 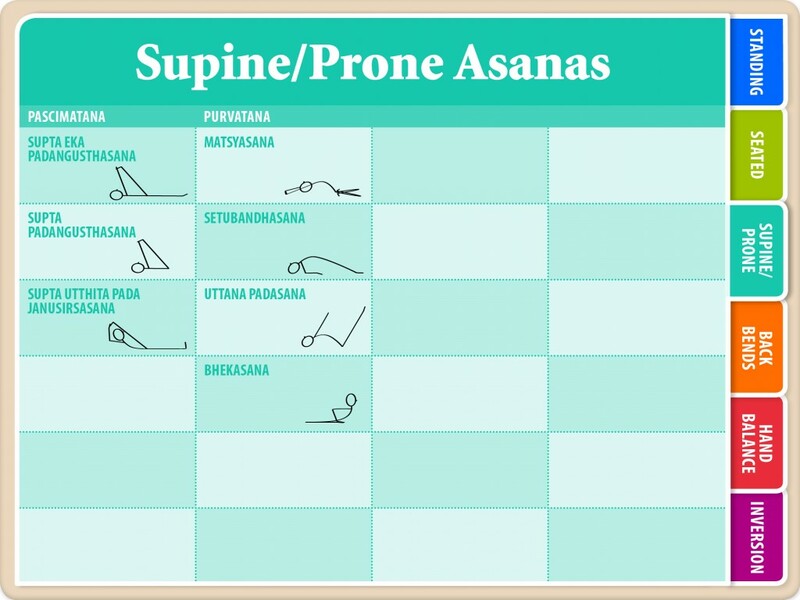 Just keep practicing and also listening to your teacher in class and the yoga pose names will soon become familiar. 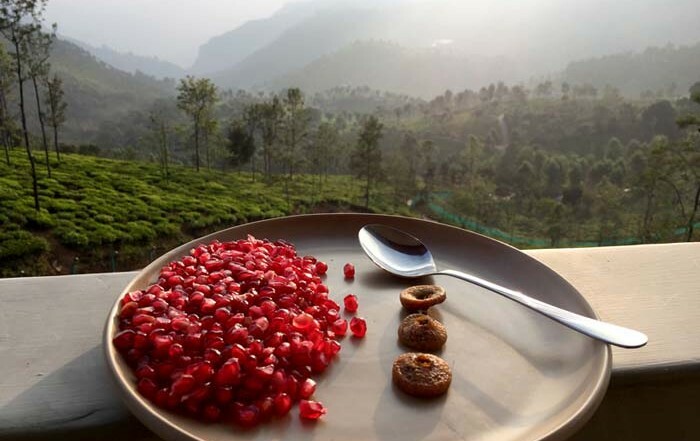 Also take notice of how the Sanskrit language is broken down into small words that are linked together. 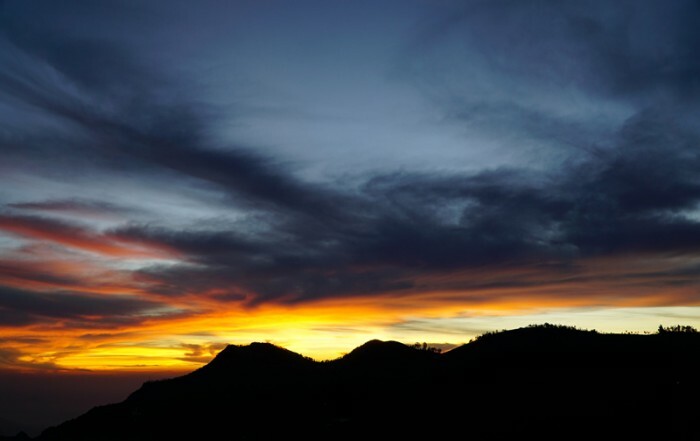 You will find that once you learn the word for “up” (urdhva) or “down” (adho), for example, it is easier to start piecing words together. 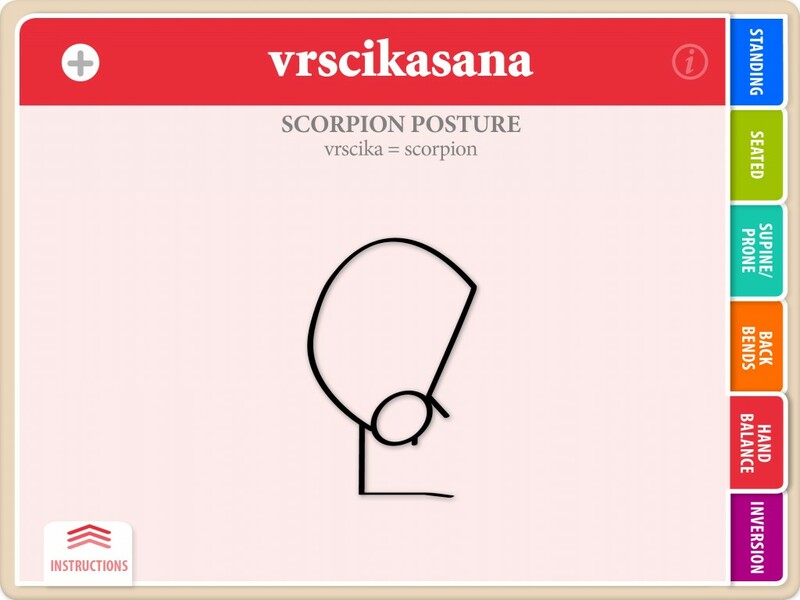 The printed Viniyoga Asana II Flash Cards have exactly the same information as the interactive eBook versions. 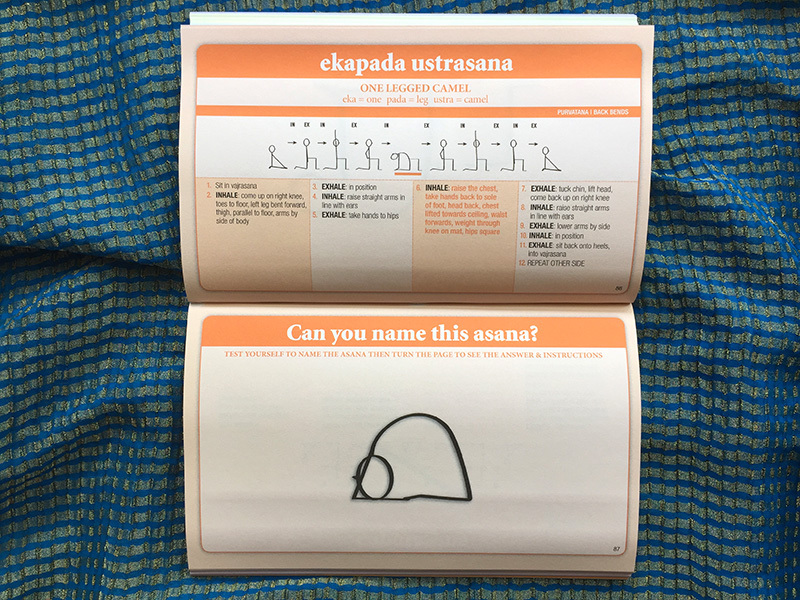 On one side of the page is the stickman illustration with the prompt asking “Can you name this asana?” Test yourself to name the asana without looking. 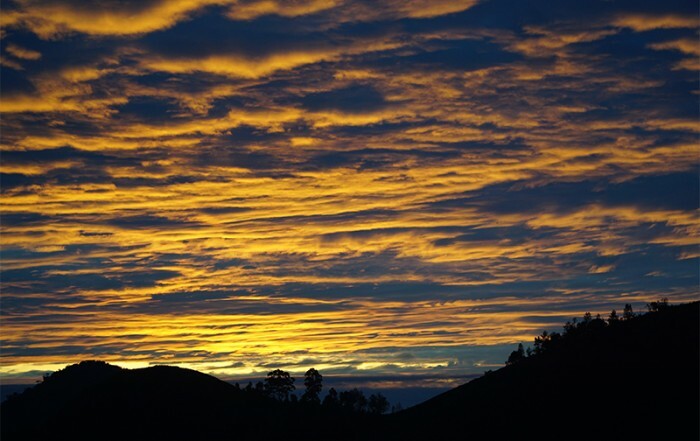 To find out the answer, just turn over the page. 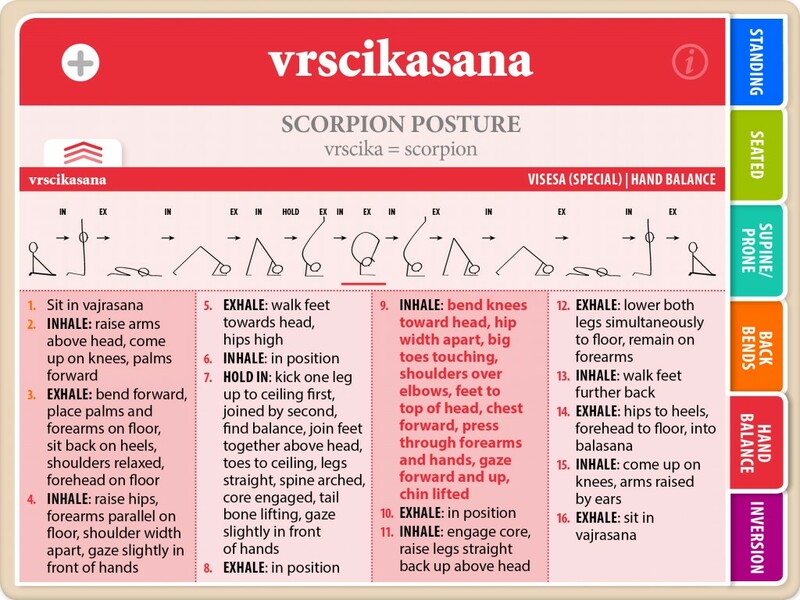 You will then find the asana name and the instructions for the vinyasa-krama sequence. 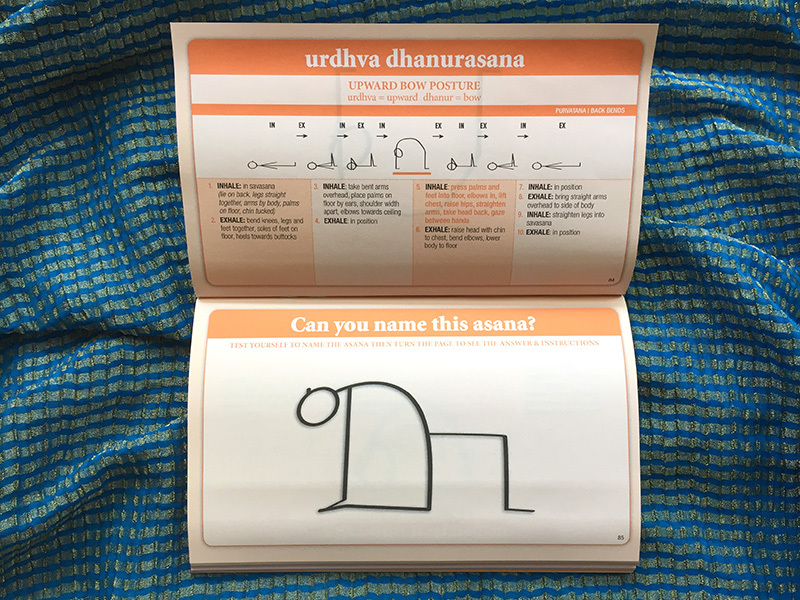 The Viniyoga Asana II Flash Cards Yoga Books are divided into 6 colour tabbed sections, breaking down the asanas into sets according to their form (standing, seated, backbends, hand balances, inversions) and subdivided into their main classifications in the section index (as listed below). 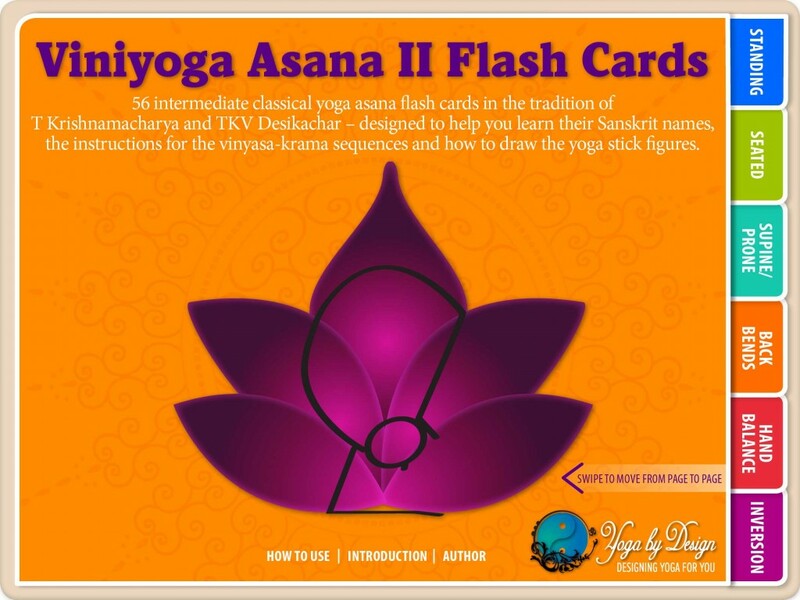 Most of the asanas in these intermediate yoga flash cards will have aspects of more than one classification, in this case it is the main effect, in the final form of the asana, that is taken as its classification. 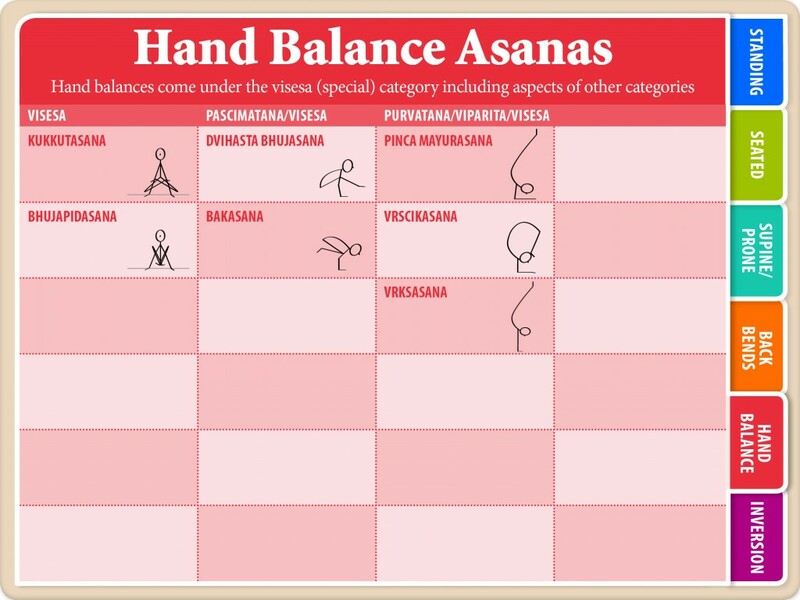 Visesa – Special – Asanas that require more effort or extra special focus to practice. 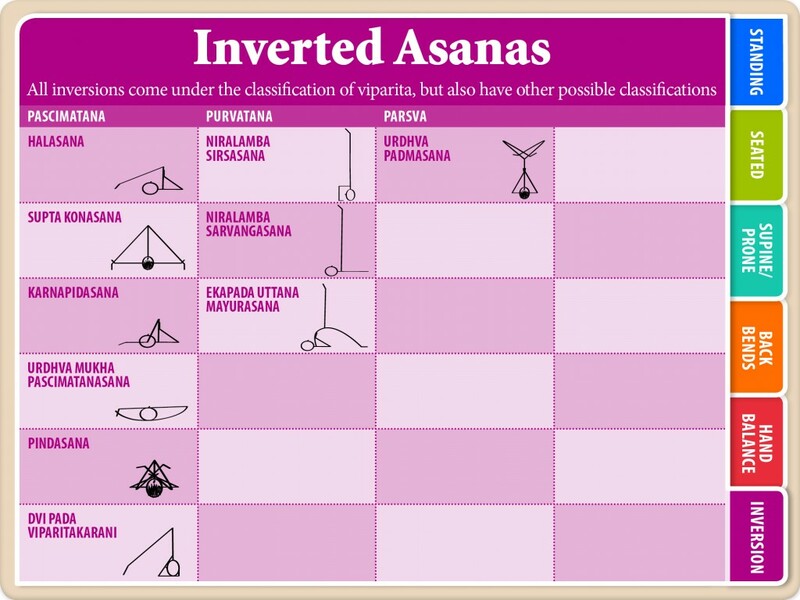 The majority of the asanas in Viniyoga Asana II come under this classification. 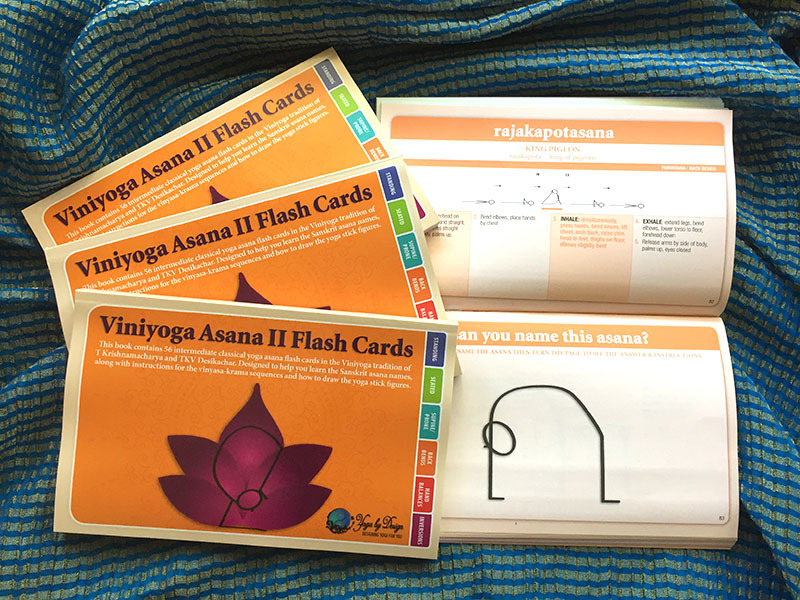 The Viniyoga Asana II flash cards are divided into tabbed sections according to their form – standing, seated, supine/prone, back bends and inversions. 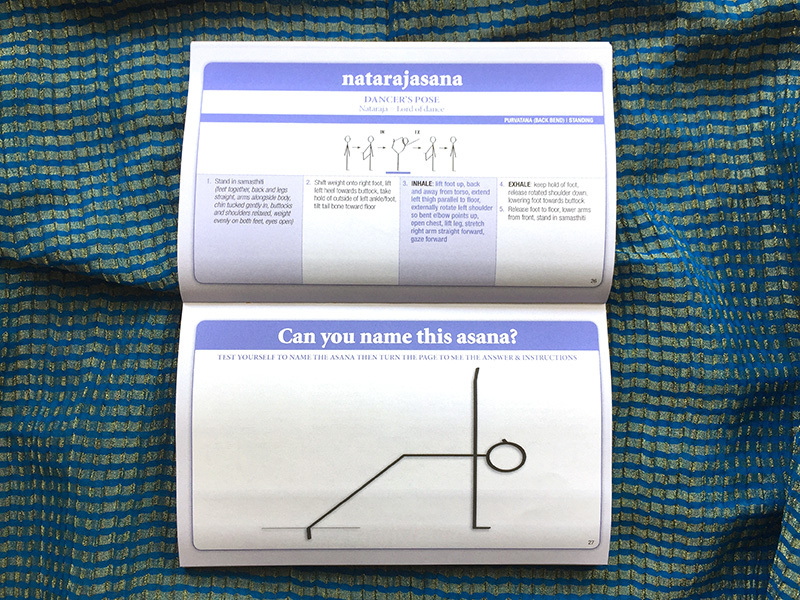 Sections begin with an Index Card showing all the yoga poses for you to study. 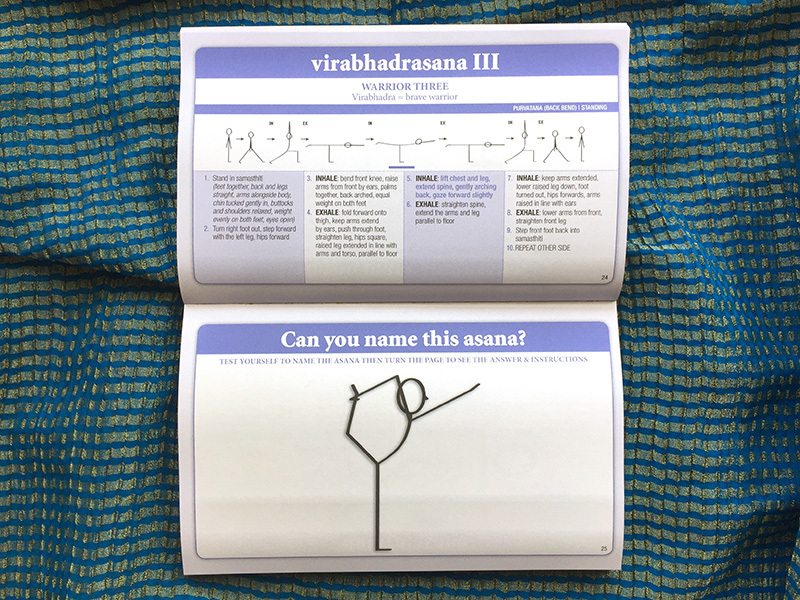 Just tap on the stick figure of the yoga pose you wish to study to be taken to that page directly or swipe through the pages one by one.